In addition to his fêtes galantes, scenes of military life were among the subjects that Antoine Watteau depicted during his career. 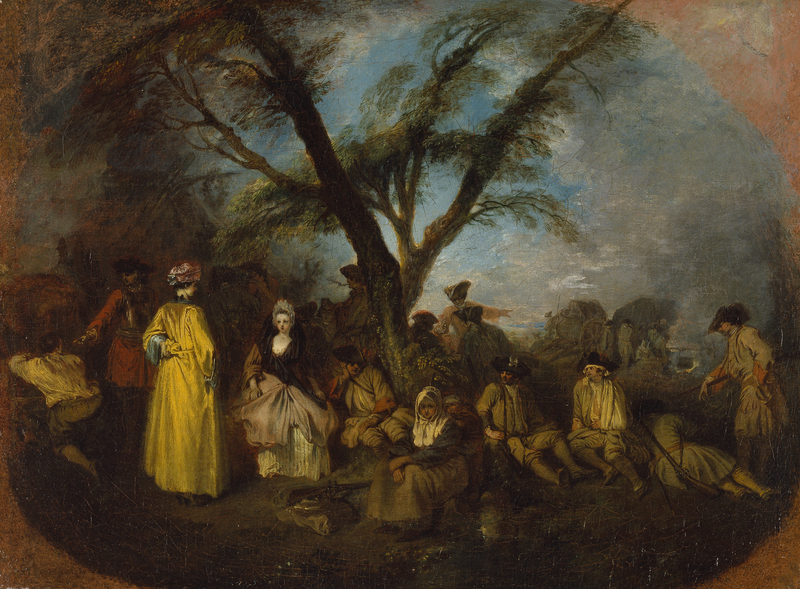 Watteau’s interest in the life of the soldier dates back to the outset of his activities, and the first works that he sold to a dealer were two paintings on this theme. In 1709 Watteau entered the competition at the Académie with a military painting and although he did not win the first prize of a trip to Rome he gained an honourable second place. This disappointment led him to return temporarily to his native city, located in an area of France that was involved in a complex political situation at that date, but which inspired the artist to develop and expand military subjects in his repertoire between 1709 and 1710. During those years Louis XIV was involved in a campaign in northern France and Valenciennes was one of the cities affected by the conflict. Among recent events, the Duke of Marlborough had won victories at the battles of Oudenarde in July 1708 and Malplaquet in September 1709 and had defeated the French Marshal Villars. This was the atmosphere that Watteau encountered on his return to his native city and which, to judge by the works of this period that have survived, inspired the creativity of the young artist who made sketches from life that he later worked up into new compositions. In these scenes, however, Watteau was not concerned to show the combat directly but rather focused on the everyday life of the soldiers off the battlefield. Thus, among the subjects that interested the artist were parades, encampments, marches and moments of rest and leisure; in other words, the life of the soldier when not fighting. The present canvas is painted in an oval format. It belonged to one of Watteau’s biographers, Jean de Jullienne, in whose collection it was to be found in 1729. From there it passed into the ownership of the Prince Conti, also in Paris. Following its sale in 1787 the canvas appeared in the UK at Petworth House in the Egremont and Leconfield collections. In the mid-20th century it was to be found in the USA where it belonged to Duveen. The canvas was finally acquired for the Thyssen-Bornemisza collection in 1975. It formed a pair with another entitled The Parade, a now lost work known through prints. The Rest is a fine example of the spirit with which Watteau endowed these small works. The military element is relegated to the background on the right where we see supply wagons and a large cauldron on the fire. The soldiers are resting around two large trees that divide the space and are arranged in small groups that articulate the foreground. In this area in the middle of a provisional camp, Watteau locates two finely dressed women, one of whom lifts up her skrits in a flirtatious manner so as not to dirty the bottom of her dress in the mud. The two women, who seem remote from the action around them, seem to be talking to each other, watched by a pair of soldiers, one of them wounded in the head and arm. Watteau added two further figures, again not connected with the military world, in the form of a young mother and her son who also take advantage of the shade of the large trees to rest. As is usual with Watteau’s working methods, various preparatory drawings for the figures in this composition are known. They include one in the Musée Carnavalet in Paris for the woman in the yellow dress, and another in the Nationalmuseum in Stockholm of the young woman in the centre.